KEARNEY, Mo. 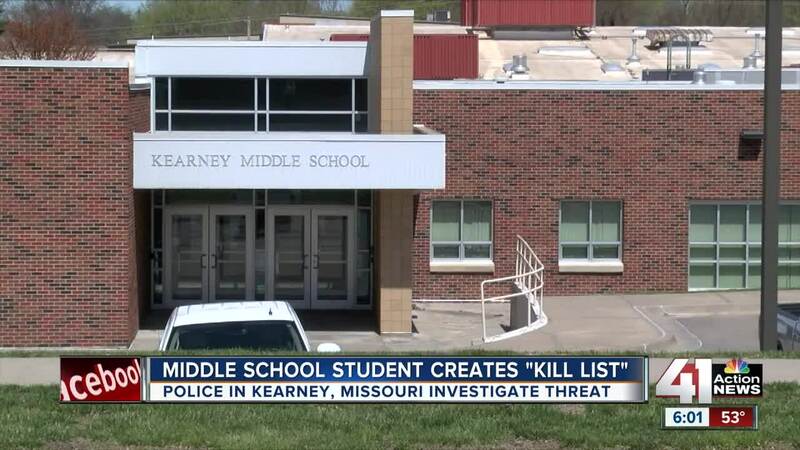 — A Kearney Middle School student's "kill list" left parents and classmates frightened this weekend. The Kearney, Missouri, Police Department said Friday evening that it was aware of the alleged threats and was investigating. The incident shook up some parents enough that they decided to keep their kids out of school Friday and might do the same Monday. "I took my child out of school Friday," concerned parent Courtney Kennedy said. "I was scared for her to be there." "Things are in an uproar," Kennedy said. "Parents are scared — me being one of them. I am very frightened for the safety of, not only my child, but the entire school." One of the students who was threatened posted a message on Snapchat that reads, in part: "[The student who made the list] threatened to kill me and everyone at KMS. He told me that he wanted to be a serial killer and kill me first. He always told me that he didn't like me and that he was going to kill me one day." Parents were equally upset by the lack of communication from the Kearney School District regarding the threat. Most parents only found out after the police announced the investigation on social media. "Finding out on social media — on Friday on social media — was just shocking," said another concerned parent, Rhonda Holland, who has a seventh-grader at KMS. "Why wasn't there a statement by the Kearney School District saying that they had the matter brought to their attention and they were investigating it?" According to the letter from Kearney Middle School Principal Bart Woods, a student notified the school counselor about another student's "hit list/kill list" and additional prior threatening statements, which had gone unreported. The district also tweaked its policy and putting a safety plan "in place to monitor the initial threats as we move forward from this incident," Woods said. "We have also made contact with all others who expressed concerns to us," Woods said in the letter. He indicated that it hasn't been school policy to send information regarding verbal threats to all parents, but it was making an exception "due to concerns being expressed on social media" and in an effort to "eliminate any confusion and misinformation." "Student/school safety is extremely important to us and is something we talk about with our students," Woods said. Given the number of high-profile incidents nationwide involving violence in schools, it's little wonder some parents are on edge when such threats hit so close to home. "We send these kids to school and we believe it's a safe place," Holland said. "You have something like this happen, and it's just hard." "Today we have conducted investigations and interviews," a post on the department's Facebook page said. "We believe that we have a much better understanding of this alleged incident. We have been working with the Kearney School District to ensure that everyone will be safe and that Monday will be another productive day of learning at the Kearney Middle School." Kearney PD also said to expect an increased police presence at KMS next week.